The closing event of the Third Way conference was a four-way panel discussion, moderated by Lisa Clark Diller. It took the form of a series of questions about interfaith experiences and lessons learned, answered in turn by each of the participants. The panelists were Muslim Amin Issa, Adventists Valerie Radu and Darleen Handal, and Jewish Deborah Levine. In addition to spanning a variety of faiths, they represented differences of age, race, culture and gender. Like many things in interfaith work and postmodernism, the doing was as important as the saying. As Issa pointed out, interfaith discussions matter. So, this closing discussion explored the raw practicalities of interfaith work by asking about the varied experiences of people of different faiths engaging those of faiths different from their own. In short, it was an interfaith discussion about having interfaith discussions. Issa shared how he came to operate a medical aid program in India, engaging with the diverse people there. He shared two guiding ideas. First, he quoted Richard Dawkins' statement that "we are all atheists" – not as a denial of faith, but as a recognition that we all have gods we don't believe in. When we realize this, we open ourselves to understanding the disbelief of others toward our own faith. Second, he shared his personal philosophy of "Screw it, just do it." This statement was the beginning of his work in India as he and his partner decided it was well past time to actually pursue their long-held dream. The implication for interfaith work is clear: stop talking and start acting — actually go out and meet people, not as ultimate representatives of their faith, but as individual believers. Radu talked about hospitality and how we must be willing to cross borders and boundaries to meet the people beyond them. Like Issa, her counsel was for action: "We make the path by walking." 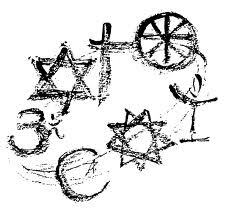 There is no road map for interfaith relations, only the singular practice of living together. A guiding idea for her is "no more throw-away people." A practice she mentioned as being particularly meaningful and relevant was truth-telling events — designated spaces and times for people to come and simply share their personal stories. Living together is about this sharing of stories — both of the past and the future. Handal's guiding principal came from growing up as a missionary kid in South America. She explained that the guiding philosophy she learned for interfaith work was "become one." For her family, this means learning the culture – the food, the clothing, the customs, the stories – in order to be able to connect. This works because, as she explained, we're all the same. At the core, we have the same love, the same hate, the same feelings. Finally, Levine spoke about the significance of mentoring for interfaith work. This has been a particular concern in her own work. She reminded the group that we cannot take anything for granted; for example, thoughtfulness is not a given, but must be taught as vital for leadership. We must seek to pass on our knowledge and to learn from those who go ahead of us. There is no one approach that will always work; there are always surprises. We must learn to harness any available resources, including technology, as we move forward. I found Issa's closing thoughts particularly insightful. First, he observed that Jews, Christians and Muslims are relatives – part of a tight genealogy. Second, he suggested that questions draw us together more than answers, both in the sense that we must ask questions of each other and in the sense that our commonalities lie in shared questions more than shared answers. David Barrett is co-producer of the Storying Life podcast, and recently completed an MA in English with a concentration in Cultural, Social and Political Thought.